When you need to pack up your possessions and store them away in the loft, basement or garage, this storage kit gives you everything you need to effectively do so. 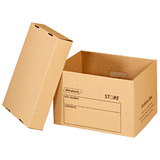 Including a variety of 20 cardboard boxes in order to store everything from your photo albums to precious antiques and keep them packaged away and safe. Also complete with a marker pen so you can clearly label your boxes for future reference. 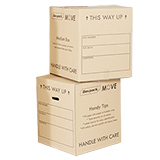 The printed moving boxes are made from superior strength double wall cardboard and the archive storage boxes are made from high quality single wall board that folds in a way to provide extra thickness strength. 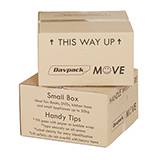 All these items are also available to buy individually if you feel you need more further supplies to store your possessions.